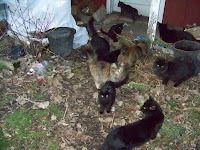 I thought I'd post some photos of the surviving cats - even though a dozen are gone, there are still a lot of cats. 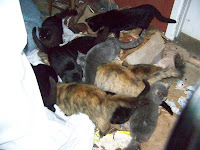 When I'm feeding them, an old picture book story I had when I was in nursery school runs through my head, "Cats here, cats there, cats and kittens everywhere". I found a copy of that book when I was teaching and used to read it to my kids - I suppose today I'd get into trouble for reading it because it's kind of gruesome, the cats get into a huge fight and there is only one survivor. At the moment, I can't remember the name of the book, but I believe the author is Wanda Gag. Gibby was really active today - running like a wild dog as usual, rolling over and over, getting tangled up with Blue and Patches, and even exploring in the weeds. 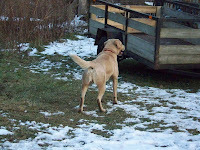 He dove into the weeds next to the garage and found the flatbed trailer. He danced around on it, left it to run around some more and returned to dance again, several times. 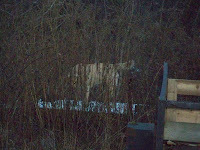 and here he is three seconds later at the other end of the yard. 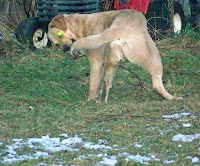 Gibby may have looked silly chasing his tail, but he was smart enough to stop once he caught it! I think Gibby liked being up high and hidden. I don't think he knew I could see him. 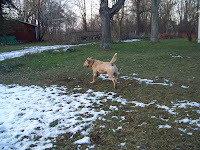 He really has good balance, the top of the flatbed was a sheet of ice and snow - its completely shaded by the garage so the snow didn't melt like it did in the yard- but he never slid across it.